Nothing like a pair of over the knee boots and an A line skirt to make me feel like the ultimate girly girl. Even without any pink or frills in the outfit. 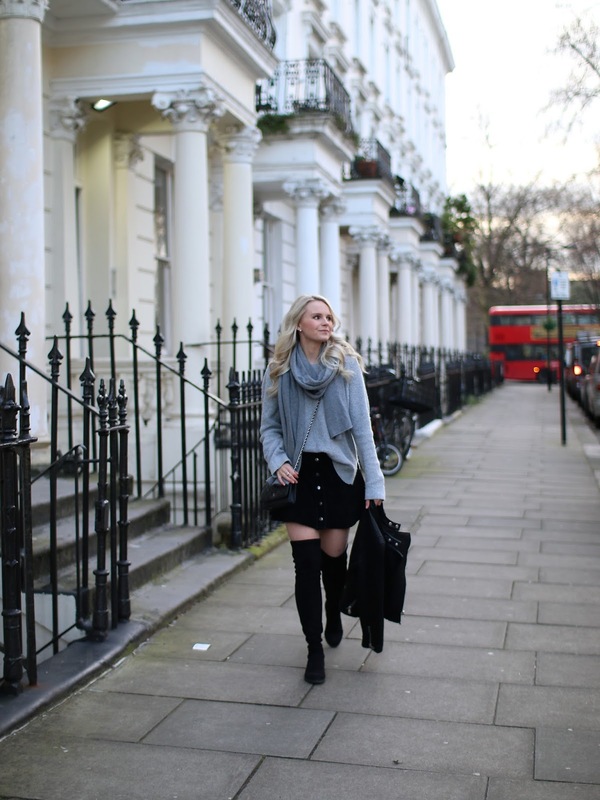 Over the knee boots are incredibly flattering so I always feel my best when I’m in them. The A line skirt fits perfectly at the small of my waist and then flares out over the hips – again, VERY flattering. Often I’ll reach for an outfit similar to this for date night. Lately I’ve been all about the grey on grey layers. I’ve bought another grey scarf, a grey jacket and 2 grey sweater. I don’t know how many grey sweaters a girl needs in her closet, but it seems as this girl needs them all. What do you feel your best in? Yoga pants, casual outfit, all dolled up or somewhere in the middle of all that (like me)?